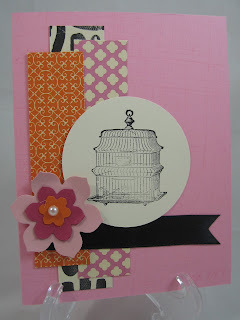 Earlier this week, I participated in a Stampin' Up! shoe box swap. There were a few requirements: use something new, and the card can't take more than 10 minutes to make. The hard part was designing a card with the supplies I had on hand. You see, we needed to make 24 whole cards, and the final numbers weren't revealed until 3 days prior. I used two different stamp sets: Sanded (background stamp) and Nature Walk (occasions mini). I used two different DSP: newsprint, and sweet and sour. The flower was created with the Birds & Bloom die cut. I wanted to add some ribbon, but didn't want to fight with any bows or knots, so I adhered a strip along the front of my card. Thank you for looking. Please stay tuned! I am participating in another card swap in a few days, so check back to see what I have made. Also, Our Creative Corner has a new challenge coming up, this Friday!